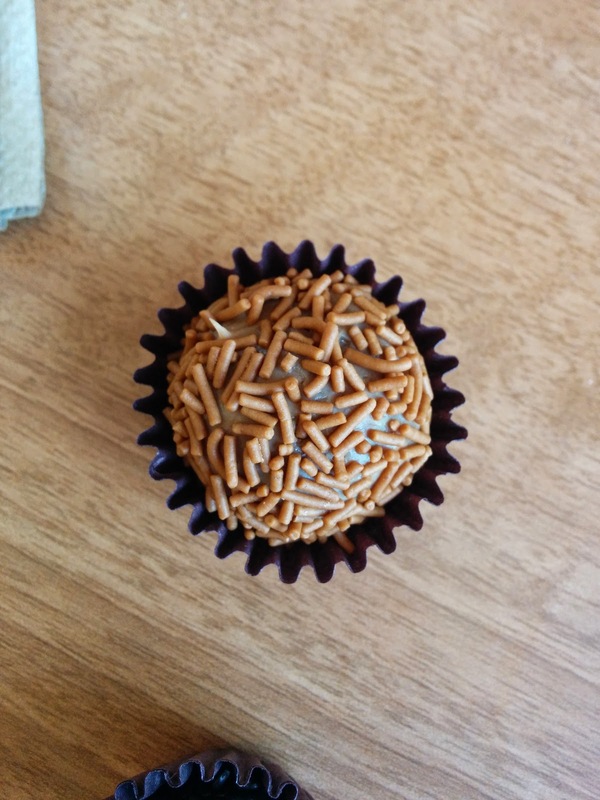 Brigadeiro are apparently Brazilian confections, made from sweetened condensed milk, butter, and chocolate, served at special occasions in Brazil. Almost like truffles or bonbons, but not quite. The name comes from the fact that they were originally made for Brigadier Eduardo Gomes. 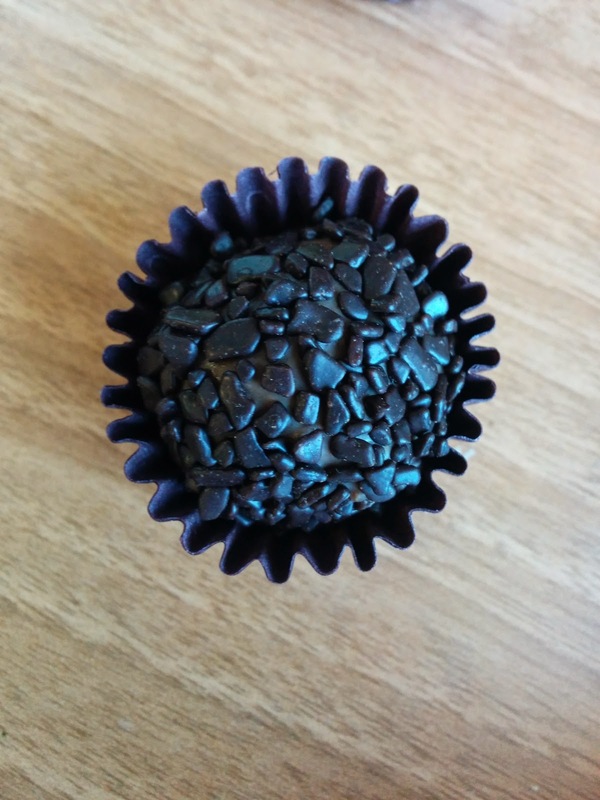 I hadn't ever encountered them before, until Brigadeiro.me came to visit our office. Brigadeiro.me is a local company, and they produce exactly one thing: brigadeiro, in an assortment of flavors. I got to try many of them. 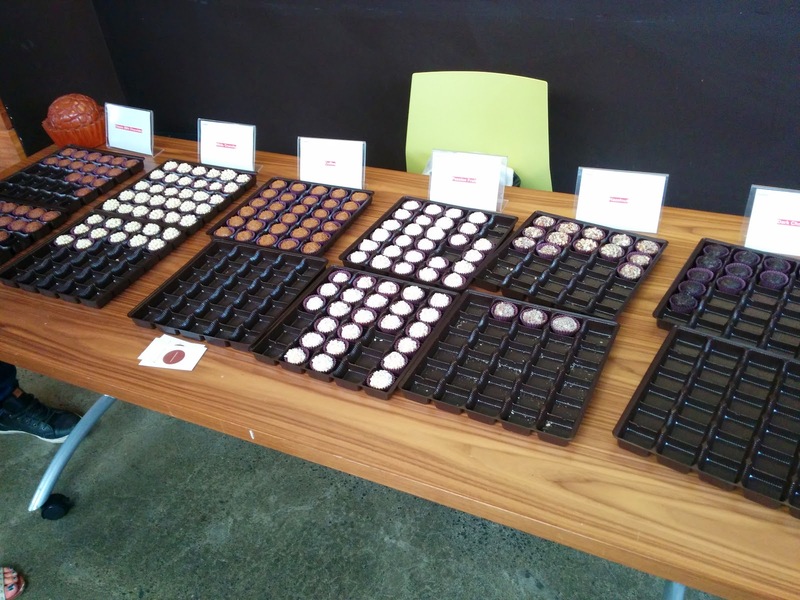 I enjoyed some of the flavors more than others, but in general, brigadeiro did appeal to me. Why haven't they infiltrated the US? I started with what I think is the most classic. 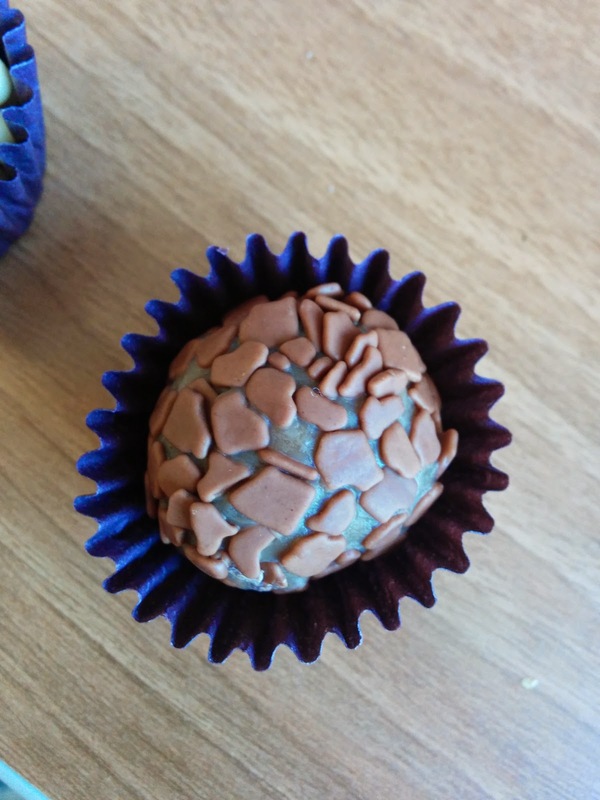 A soft caramel like ball, with crunchy chocolate on the outside. Sweet, creamy, good texture, but not particularly remarkable. Then I moved on to the dark chocolate, described as "a version with 70% Chocolate Belgian cocoa, condensed milk, butter and 70% cocoa chocolate sprinkles. It’s the perfect balance between the strong taste of cocoa and the sweet and smooth flavour of condensed milk." This one was a bit bitter, but not in a good way. I'm not sure what it was about it, but I didn't like the deeper caramel flavor. As with all varieties I tried, I liked the crunchy things on the outside, but this was my least favorite. 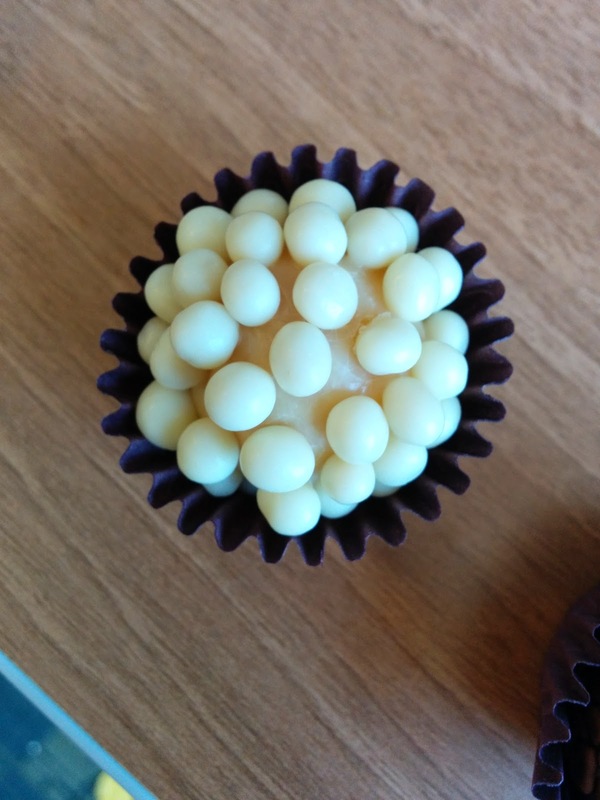 So I moved in the other direction, to white chocolate: "Belgian chocolate rice crispy sprinkles make our white chocolate brigadeiro version (Belgian white chocolate + condensed milk + butter) even more irresistible"
This one didn't have a very complex flavor. The inside was just sweet, not caramely. The white crunchy balls on the outside overwhelmed. I like those little balls, and add them to ice cream all the time, but the ratio of little balls to the actual brigadeiro wasn't right, so all I could taste was the balls. 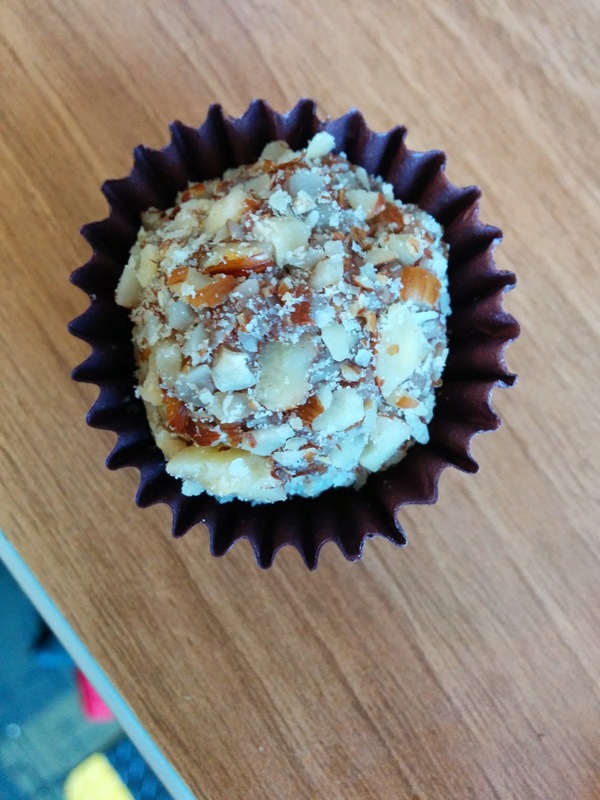 Next, I went for a nutty version, "made with hazelnut cream, condensed milk, Belgian chocolate and it’s topped off with delicious hazelnut chunks"
It was the same basic soft chocolate caramel ball, this time rolled in hazelnuts. The nuts were nicely broken down into tiny bits, and added a nice crunch, but I did find them a bit bitter, particularly with the sweet filling. And next, something a bit different: coffee: "made with the finest ground Brazilian coffee beans, Belgian chocolate, condensed milk, butter and it’s topped off with Belgian chocolate sprinkles. " The coffee in here was very subtle, but it complimented the sweetness well. It made me really think these would pair excellently with a cup of coffee. A nice black cup of coffee, sweet rich condensed milk ... mmm! This one was my favorite. I didn't expect to like this at all. I love passion fruit, the real fruit, but I tend to dislike treats that are made to be passion fruit flavor. Described as: "the most exotic of the brigadeiros, with a juicy taste that will brighten up even the rainiest of the days. It’s not too sweet, it’s super moreish, so make sure you add more than one to your box. It’s made with Belgian white chocolate, passion fruit juice, condensed milk, butter and white chocolate sprinkles"
It tasted like white chocolate, but with subtle passion fruit, not too much at all. I liked the crunch from the chocolate sprinkles outside. It turned out to be my second favorite. One day, I was walking through Pacific Heights, and saw a sign that struck my interest: "Seattle-Style Teriyaki", it advertised. Not that I wanted teriyaki, but I was intrigued. What is Seattle-style teriyaki? This is an unknown phenomenon to me. Other than the cookies, the menu wasn't really my thing, but I read the rest of their signs to learn more, and decided to try a few side dishes anyway. 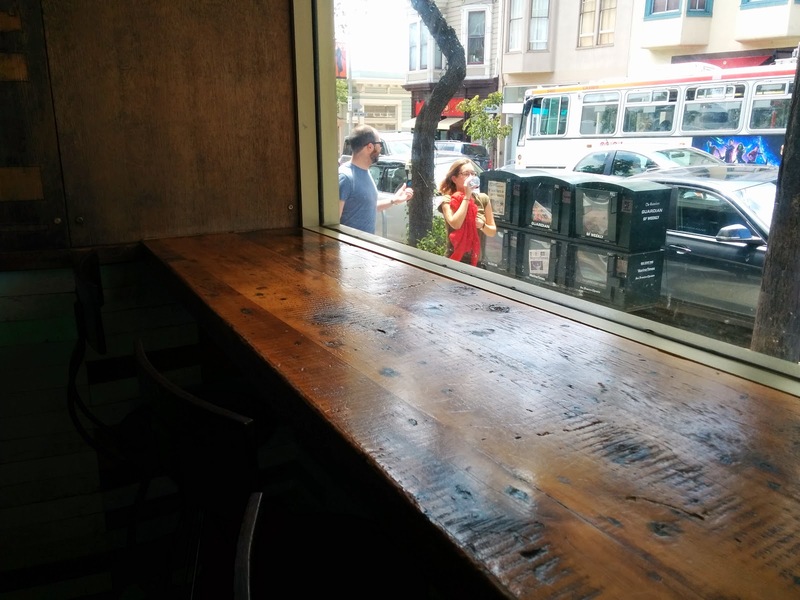 It turns out, Glaze is actually a mini-chain, with three locations in New York, and this single one in San Francisco. It was started by a Seattle native who missed teriyaki when he moved to New York. The website claims that teriyaki is to Seattle as pizza is to New York. I've only been to Seattle once or twice, and I guess I just didn't notice this? Anyway, even for a fast-casual place, Glaze cares about quality. The meat is all-natural, antibiotic-free. The salmon is never frozen. Salad dressings and sauces are all made in house daily. Every dish is made to order, which you can see in the small open kitchen taking up most of the store. 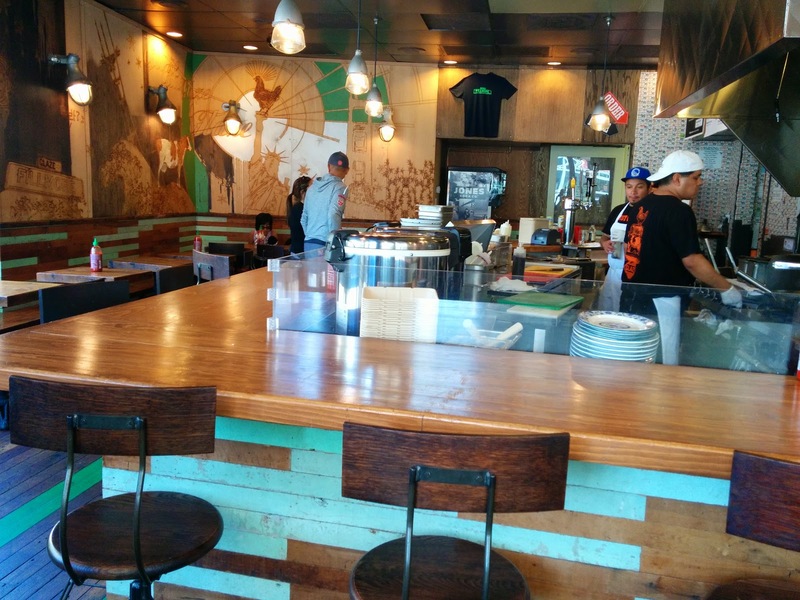 There is counter seating with high wooden stools all along the kitchen area. There a second counter, again with stools, overlooking Fillmore Street, perfect for people watching, which is where I set up shop. If you go with a group, or don't like to sit at counters, there are also a few wooden tables for 2-4 people. 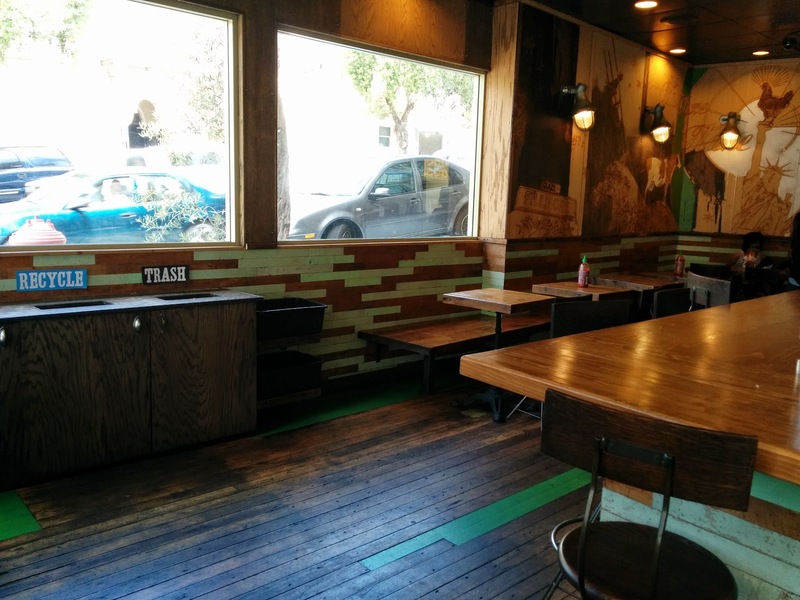 But the majority of the seating is counter-style. Since Glaze is a casual place, you order at the register, and seat yourself. Next to the register is a station to get whatever cutlery and napkins you desire. Food is brought to the tables when ready. Afterwards, you bus the table yourself in the provided bins. I didn't love my selections, but I really appreciated that everything was made fresh to order. I'll likely return to try some other items, as I like everything about the place, and if I ever want teriyaki, this does sound like a winner. Crispy Vegetable Gyoza, homemade dipping sauce. $4. Since I didn't want teriyaki, I went for the gyoza, a side dish. 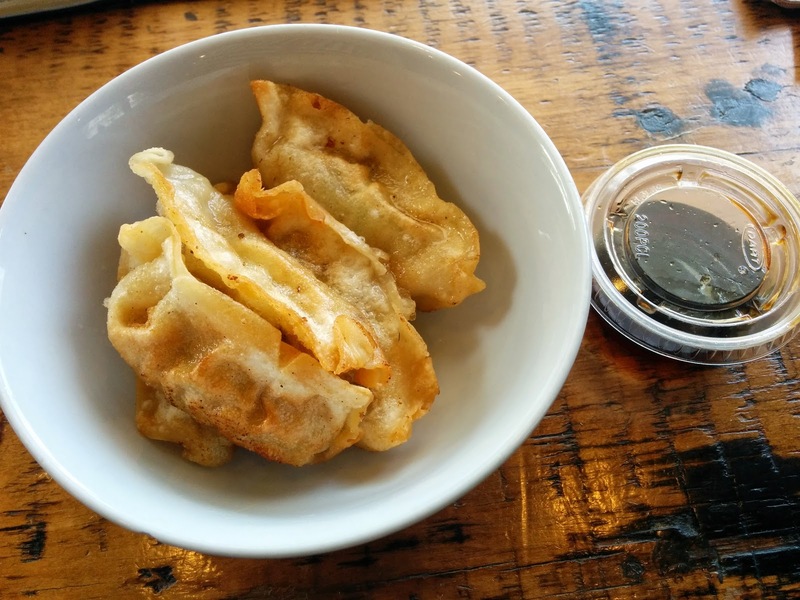 Not something I normally would order, but Yelpers all rave about the gyoza. I had the choice of chicken, pork, or vegetable, and I picked vegetable, because I hate chicken, and generally dislike pork. It took about 10 minutes for my gyoza to be prepared. They arrived piping hot and fresh out of the fryer, served in a cute glass bowl. They were absolutely dripping in oil. Pools of oil were visible in the folds of the individual gyoza and the bottom of the dish they were served in was like a little pond. All I could smell was oil. Undeterred, I drained them on napkins myself, and took my first bite. They were ridiculously hot and fresh. I had to wait a few minutes before jumping back in. Inside the veggies were kinda just a pile of mush, including carrots and cabbage, but I didn't taste the vegetables. The oil overtook all the flavor. The dipping sauce came in a plastic container, a bit strange for dine-in, and was also fairly flavorless. It seemed like just a very mild, light, soy sauce. Overall, not very good, but I did really like how crispy they were. Super, super crispy. But they really needed to be drained before serving. $4 for an order of 5 as a side dish was fine, but I wouldn't get them again. Cold Soba Noodle Salad. $4. I also decided to get a side dish to go, to bring home to eat later that night. 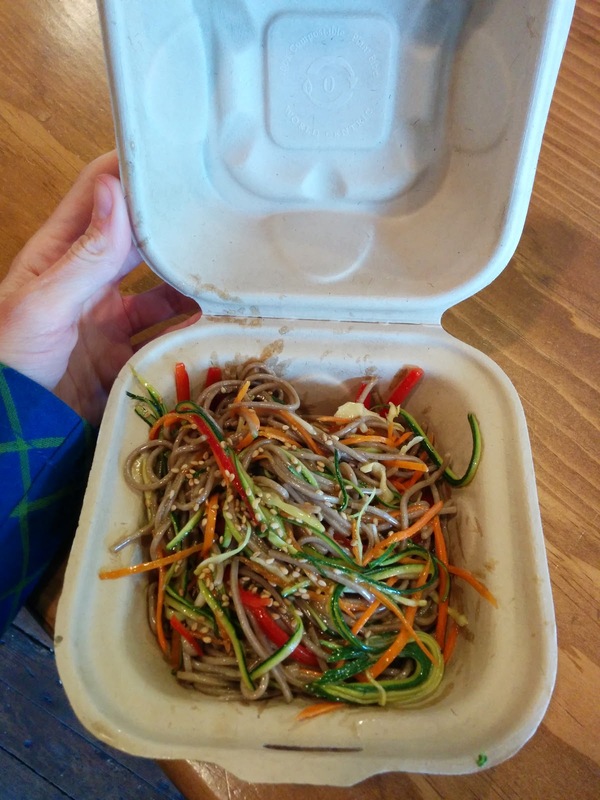 I went for the cold soba noodle salad: "buckwheat soba noodles and vegetables tossed in house-made sesame dressing, topped with sesame seeds". I recently had a soba noodle salad that I really liked, so I've been craving another one since, a bit random for me. I was excited to see this on the menu. The soba noodles were decently cooked, although a bit mushy for my taste. I really liked the veggies: carrots, red peppers, and zucchini, all thinly sliced and long, mimicking the noodles. But, I didn't care for the sesame dressing. It was sweet, and very oily. The noodles were over-dressed, tet the flavor just wasn't there. This same dressing is also offered on the teriyaki, so maybe it works better there? I appreciated the sprinkle of sesame seeds on top for crunch. Overall, I didn't care for the dish, but I appreciated the fact that even this side dish was made to order - noodles were tossed with the veggies, the dressing added, the top sprinkled with sesame seeds, when I ordered, rather than in advance. $4 was a fine price for a made-to-order dish of this size, but I didn't like it, and wouldn't get it again. To start our Michelin experiences, we went to lunch at Tateru Yoshino, the Shiba location. Chef Yoshino has 3 restaurants in Tokyo, all with Michelin stars, although the Ginza and Shidome locations only have 1 star each, thus, we went to Shiba, since it holds 2 stars. The chef also has a Michelin starred restaurant in Paris, Stella Maris. Given the pedigree, I had high hopes for this meal, but it turned out to be by far the most mediocre of our higher end meals. I didn't understand why it had 2 Michelin stars, and would even question having a single star. Granted, we went for lunch, not dinner, but I expected much more. The food was all well presented, but execution and flavor just were not there. 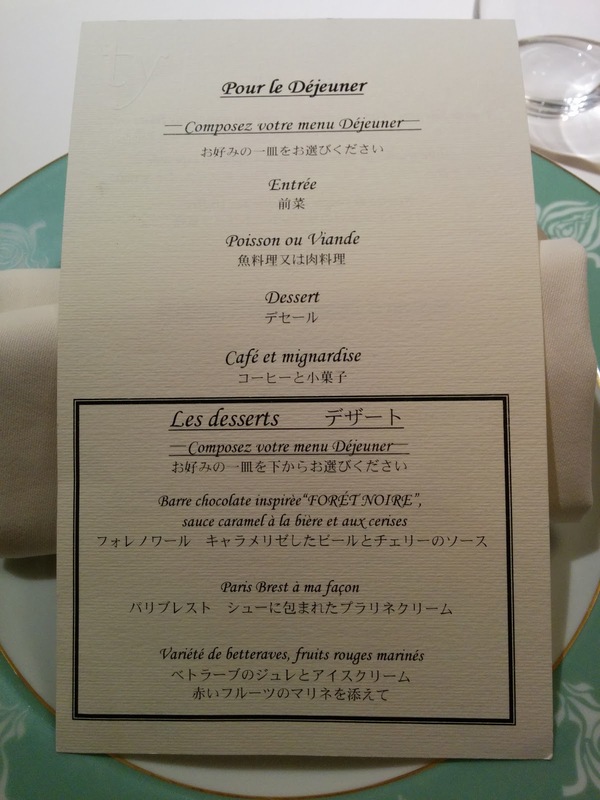 The restaurant is located in the Shiba Park Hotel, making it quite easy to find, unlike most places in Tokyo. Since we were a group of 6, they seated us along the back of the room, in a semi-private alcove. While we still looked out into the main restaurant, it was nice to have this sorta private space. Our party of 6 was considered a large group, so we were asked to pick which set menu we'd like in advance, when we made the booking. Our choices were either ¥3,637 for a menu consisting of several amuse bouches, our pick of appetizer, our choice between several fish or meat dishes, a choice of three desserts, plus coffee/tea, and migs, or, for ¥5,273 we could have both a fish and a meat entree. We all had to pick the same number of courses, but could select whichever options within the category that we wanted. Since we were going to another 2 Michelin star restaurant for dinner that night, we didn't want to overdo it, and decided that the 3 course, plus amuses/migs, was plenty. As you'll see below, this was an incredible value, coming out at ~$40 per person, including all fees. 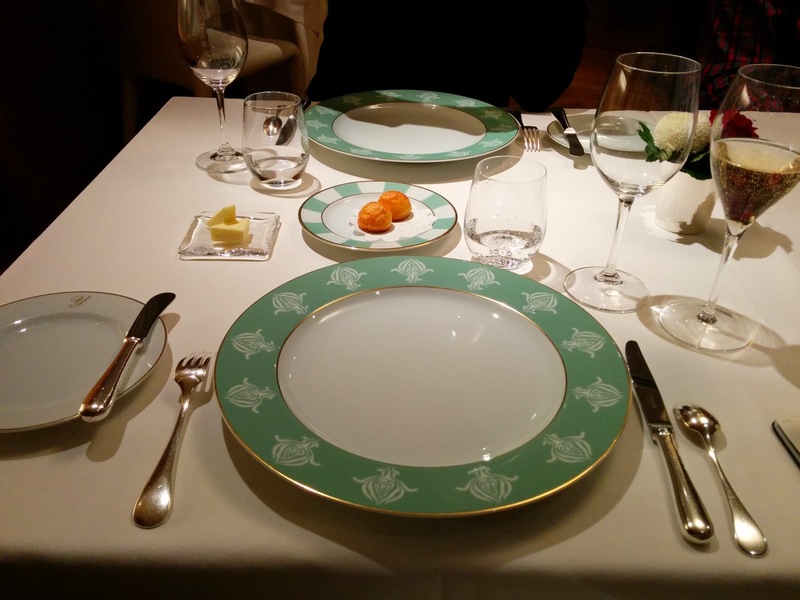 Can you imagine getting 2 Michelin stars, including foie gras, for that price elsewhere? The price point was really incredible, but the food ... mediocre. The restaurant was quite formal, from the place settings, to the roses on the table, to the very polite, stoic waiters who all wore bow ties and jackets. It never felt quite comfortable. Service was good, but never personal in any way. The first amuse arrived soon after we ordered, little cheese puffs, two each. They were a bit cheesy, but not served hot, not remarkable, and no one took a second one. 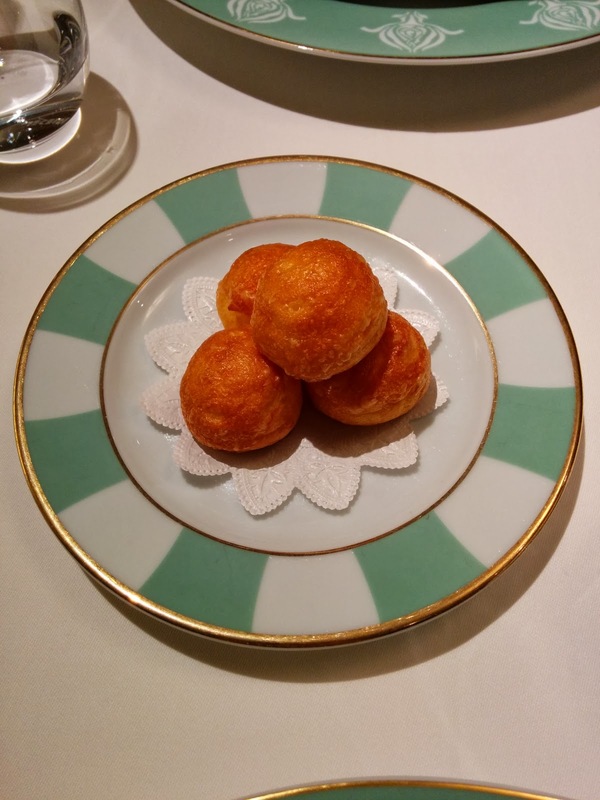 They did make me remember the incredible gougeres we had at lunch at Cyrus, which were served warm, and were filled with liquid gruyere. The first bread service began with bread sticks, served warm. It had a nice crust, and was served with quality butter. I always appreciate warm bread. The second amuse bouche was described as a turnip mousse. I wish I'd been able to ask for more clarification, since we couldn't really figure out the layers. The main component was obviously the turnip mousse, very creamy, and well, very turnip-y. On top was a green foam, with a very intense herb flavor that we all recognized, but couldn't identify. I'm still mystified. On the very bottom was something that seemed like a poached fruit, perhaps it was turnip, but again, none of us could identify it. This was interesting, and had a lot of strong flavors going on, but it wasn't particularly good nor bad. Appetizer: Foie gras coated with carrot, truffles, and pistachios. When I saw the appetizer choices, there was obviously only one option: foie gras! Most of us ordered it, as it was a special treat for us, since foie is illegal in California. The foie was decent, creamy, mild flavor. Truffles inside, and meticulously cut carrots surrounded it. The carrots were crispy, perfectly cut, and certainly showed of some serious knife skills. But ... why carrots and foie? Not really a great pairing. The carrots had some sweetness, which you want with foie, but a fruit component would have been far more successful. There was a tiny bit of fig jam and a sweet syrup on the plate for some additional sweetness, but, it all felt a bit pedestrian, and not quite inspired. Toasted brioche was on the side, a cute little thing, but it was over-toasted for my liking, too crispy. 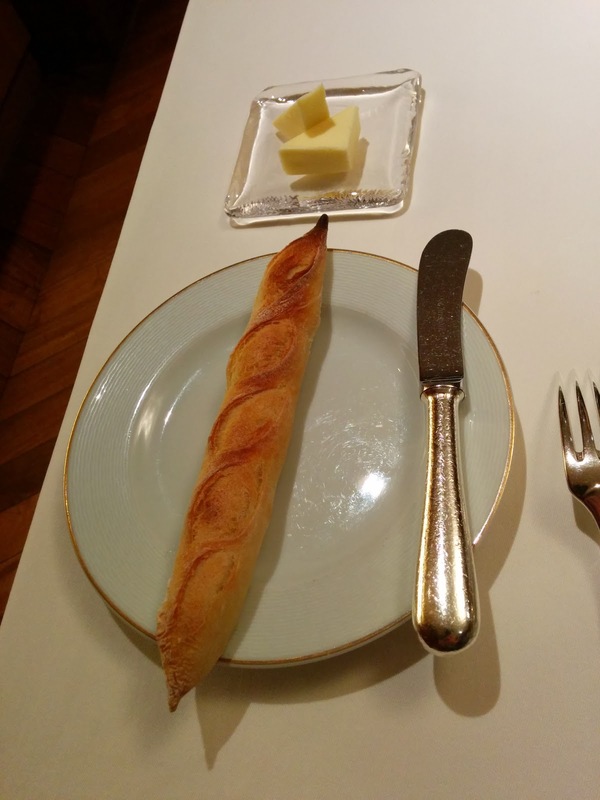 I ended up using the baguette instead, as it was softer. Overall, this was a bit disappointing. It wasn't bad, but, for something I get to eat so rarely, I wanted better. Appetizer: “Mille-feuilles” of tuna and eggplant tapenade sauce. +￥600. Those who did not get the foie opted for tuna. The tuna looked pretty extraordinary, but I didn't get a bite of it. It had a￥600 supplement, which was surprising to me, as I'm use to foie requiring supplements, not fish! Main: Lightly cooked salmon, “Stella Maris” style. For my main, I picked the salmon, a signature dish from Chef Yoshino's Paris restaurant. In our group, all but one person choose it. The salmon was indeed lightly cooked, sorta half cooked, not quite raw, not quite cooked, almost smoked? It was very moist and tender, but not quite in a good way. It had a slight smoky thing going on. It wasn't bad, but the texture was a bit strange, and the quality didn't seem that high. Topped with a tiny bit of cream and chives, served atop a broccoli sauce, with intense broccoli flavor. The potato cakes on the side I really didn't care for, they were oily and rather cold. I did like that the salmon and potato cakes were sorta a play on smoked salmon and blinis, but, neither component was great. What was great however were the veggies on the side. Broccolini, watermelon radish, peas, green beans, fava beans. All perfectly cooked, a bit crispy, expertly seasoned, buttery, flavorful. Definitely the best part of the meal, even over the foie gras. Yeah, I said it. I think Emil agreed as well. Japanese Beef steak, with lightly brown sauce. +￥1,600. The one who didn't order the salmon went for the beef. I didn't get a taste of it, but the diner opposite me choose the steak, so I got to admire it. It looked quite good, and he cleared his plate faster than anyone else. Pretty sure he made the right choice here, even with the ￥1,600 supplement. After the main meal was brought out, more bread choices were presented, either a roll or focaccia. Neither were served warm, and that bread basket sat on a table on the side of the room throughout the meal, brought back over when we ran out, but never refreshed or warmed up. Sad, since the first bread was warm! 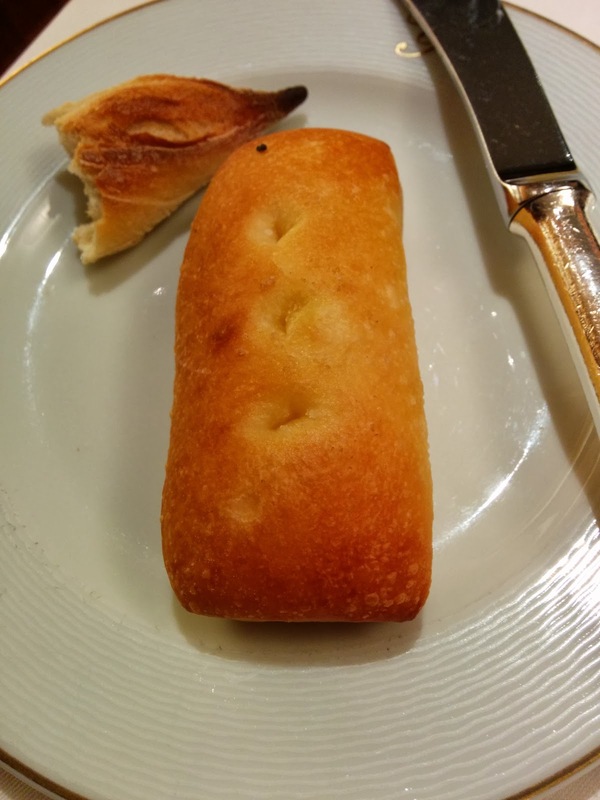 I am not normally one to fill up on bread, but for some reason I went for a focaccia stick. It was a great decision, soft, buttery, salty, great flavor. Quite good for bread, and I wish I'd had this to pair with my foie gras instead. One of my dining companions was a bit busy with his phone. Emil cared most about having a great glass of bubbles. And me? I needed to take notes! Since I was going to be rapid fire eating so many fancy meals over the course of a few days, I knew I had to take meticulous notes, else I'd forget all the details. Hard work being a food blogger! Dessert: Paris-Brest à ma façon. For dessert, we had the choice of 3 items, one pastry, one fruit, one chocolate. The dessert menu wasn't particularly inspiring, but I do love pastry and cream, so I went for the classic paris-brest. It wasn't very good at all, which is surprising, because it is such a simple classic. The choux pastry was burnt, stale, dry. There were two creams inside, one was a praline cream, the other plain. Both were ok, decent cream, but, you can only save a dessert so much with cream, and it wasn't enough here. The brûléed banana was even less successful, super strange, as it was actually frozen, and cold. I'm all for contrasts, but this didn't work. It was just a icy, yet soggy, banana. I liked the crunch from the crumbled hazelnut on the side. Not a winner, I certainly wouldn't get it again. Dessert: Beet jelly and ice cream with red fruit marine. Since Emil doesn't like dessert, he went for the only fruity sounding one. It was a beet jelly, with fresh fruit, and crème fraîche. It looked pretty, and he actually ate a few bites of it, which is saying something for a dessert. Dessert: Chocolate stick “FORÉT NOIRE” style cherry sauce and beer caramelized. Everyone else picked the chocolate dessert. A chocolate layer bar, with vanilla sorbet. I got one tiny taste, and it was good, but I did not have enough to really evaluate. But given the fact that they all continued to rave about it for days, and compare every other dessert to it, it was the clear winner of not only the meal, but of the whole trip. Coffee or tea were included, and I as usual went for decaf. It really wasn't good. Decaf isn't generally very good in the US, but it is downright horrible in Tokyo. I didn't find anywhere where it was even remotely good. Slates of mignardises appeared soon after the coffee, a slate for each pair of us. They contained a macaron and canelé each. I'm incapable of having canelés and not thinking of the amazing ones from Keiko A Nob Hill. Those will forever remain in my mind as the gold standard. They were perfect. These, like the ones I had a day prior, were not. Yes, the outside was crispy and caramelized, the inside moist, but the whole thing just tasted burnt. Not caramelized, but burnt. It wasn't horrible, but certainly wasn't good. The macarons were a mixed bag. Each slate had two varieties, one each, and the different slates had different flavors. Thus, the awkward who-gets-which-one game ensued. Lucky for us, several people in our group didn't want any, so we got to try more than one each! I didn't have the chocolate one, but it had a chocolate cookie, and the filling was both a chocolate ganache and a cream, a rather non-standard filling for a macaron. I went for the raspberry, again, with with a duo of fillings, raspberry jelly and cream. I also got the lemon one, rejected by everyone else, filled with lemon gelee and cream. Both were sweet, flavorful, and pretty good. I liked having both the sweet and creamy components inside. The cookie part was well executed, with a good crust, yet light and airy. Very decent macarons.